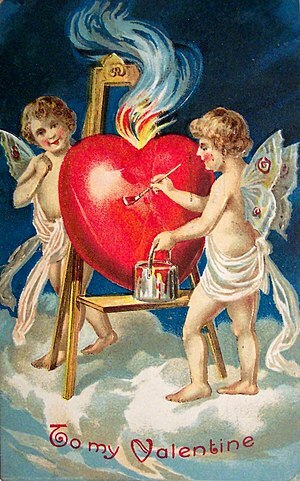 Mamma Vintage: Happy Valentine's Day! We will be celebrating the day by taking lunch to Jason at work, something we get to do every once in a while and that we all really enjoy. It's nice to see Jason in the middle of the day. His building on the Fred Hutch campus has a wonderful break room that overlooks Lake Union, so we can watch the busyness of downtown Seattle and the seaplanes landing and taking off. I like Valentine's Day. We never make a really big deal out of it or anything, but it's nice to have a reason to acknowledge, appreciate and spoil the one you love a little bit. Something that really irritates me is when married couples have a cynical, bad attitude about the holiday. Married couples should feel sincerely grateful for how lucky we are, not groan and complain because they feel obligated to make a loving gesture to their spouse. The pursuit of love is a common theme of mankind throughout all of history. If you are married, do not diminish the blessing that you have in your spouse! You have what so many others are looking for - a companion for life. All of life's trials and heartache can be made easier to bear through the love you have for your spouse and their love for you. And all of life's blessings and joys can be made richer and deeper through that same love. This is worth celebrating! You need not buy a $100 bouquet of roses, get reservations at an expensive restaurant or buy your spouse diamond jewelry (although I'm sure that wouldn't hurt). I've heard all of the reasons why Valentine's Day is stupid. I realize that the holiday originates with St. Valentine's martyrdom. I realize that much of it is a marketing scheme. But so what? Even so, I am not above writing my darling Jason a love poem, doting on him, holding hands with him on the couch and letting him know how much I love him. My dear, dear Jason - I adore you. You are my everything. I am quite in love with you my dear! I think I'll forego the attempt at mangling a love poem, if you don't mind. But know that if I could ever manage to rhyme words in a non-trite way then I would set the page on fire.